Onice serves as General Manager of LRdE. She is responsible for the day-to-day operations, including all of the full time ministries. Additionally, Onice serves as coordinator of our short-term mission teams. Onice is a very hard worker and strives to serve with excellence. She has wisdom and maturity far beyond her years and always has a great attitude. Onice graduated college with a degree in International Diplomacy. She is smart, sociable and has a heart to help and serve others. Onice is married to a wonderful man named Alvison. Together they are raising a sweet little boy named Declan and will soon welcome a new baby to their family. Onice enjoys traveling, cooking, eating and spend time with her family. She also enjoys attending church and singing. Rebeca is the director of Niños de Luz, the school program at LRdE. She also serves as lead teacher, assistant to the Executive Director. She translates, assists with meetings and team planning and helps out in any way she is needed. Rebeca was born in Granada but she currently lives independently in Diriomo. She is the youngest of three sisters. Rebeca is a very thoughtful, friendly and out-going person. She is joyful, helpful and so fun to be around. She is a strong Christian and she loves serving the Lord and his people. She sings beautifully and dances too! She serves at her church as the youth leader. Jeyling is the Administrator and Coach of our Business Academy. She is very hardworking and loves to be organized! She helps with the planning for our volunteer teams and also helps translate for teams. She has a degree in Business Administration and another one in English as a language. Jeyling was born and currently lives in Masaya. She’s married to David Muñoz. She is active in her local church and helps lead an English Conversation Club for anyone that is interested in learning this language. She enjoys reading books and spending time with her husband and family in her free time. Recently, Neydi completed her nursing degree. We are very proud of her for this accomplishment. Neydi is currently serving in our clinic, Clínica Mejor Salud. She is responsible for the day to day operations and taking care of our chronic patients. Neydi is married and has two beautiful children. She and her family live with her mother-in-law in Diriomo. Neydi really enjoys spending time with her family and teaching her children new things. She likes performing in dramas with her church drama team and she also likes to sing. Neydi says she loves her job because she has opportunity to serve God and her community. Adys is one of the schoolteachers in our educational program Niños de Luz. She also serves as assistant to our onsite general manager, helping out in the office, in team planning and in any way she is needed. Adys works hard and always does her job with the best attitude. She is a joy to all of her fellow staff members and everyone she comes in contact with because she is friendly and has a humble heart. Adys was born in Masaya. She’s single and currently lives with her family in Niquinohomo. Adys serves in her local church as the leader of children’s ministries. She is currently studying English in Masaya because she wants to be able to communicate with the volunteers who come to serve at Los Rayos. In her free time Adys volunteers with Tia Linda Ministry. She is passionate about sharing the love of Christ with children. She enjoys singing, eating and spending time with her family. 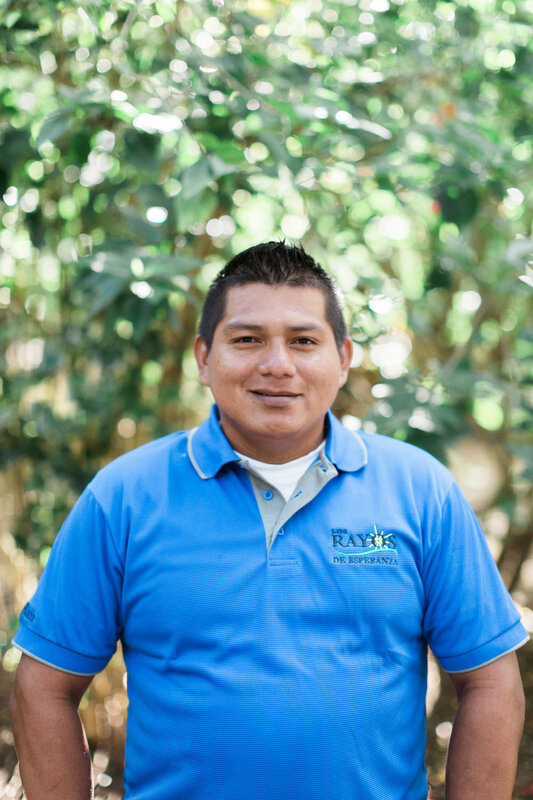 Winston works at Los Rayos de Esperanza as a translator when short term teams are on site and he also teaches in our education ministry, Niños de Luz. Winston is a very optimistic and pleasant man. He believes in teamwork and always abides by one of his major life and work values, responsibility. Winston lives in Granada with his wife Rebecca and his son, Jeremy. He studied at the university to be an English Teacher, which is one of his favorite things. He has been teaching for more than 16 years and he is excellent with children and teenagers. Winston loves to play basketball in his free time. He is also always willing to help his wife with house chores and when he has time, he enjoys reading a good book. On weekends he likes to take his family out for a walk around the lake. Alberto has several roles at Los Rayos. He serves as translator and driver for the Executive Director and for short team teams. He is an excellent handyman and is always willing to help out in any way he is needed. When not working at LRdE Alberto works in light construction, painting, repairing things and renovating houses. He also helps to harvest the fruit on his family’s farm. Alberto is a really fun guy; he is smiling all the time and has a most pleasant personality. Alberto has a sweet and fun daughter whom he adores. He is a good father and is fully dedicated to his family. Regina is the House Manager at LRdE. As such, she is responsible for overseeing all of the cleaning and cooking staff. She is also our head chef when volunteers are on site. Regina was born and raised in Diriomo and still lives there. She is a single mother of a beautiful girl named Clarysa Elena. They both enjoy spending time in the kitchen together. Regina lives with her mom, Maria, her grandma, Rosa and her brother Mario. She loves going to church with her daughter and taking her to the park, after the service. Regina is known for her ability to make a great cake and cook up some delicious meals. What isn’t so well known is that she loves being challenged and learning new things. In addition to working for LRdE, Regina has a small business of her own, baking cakes and other delicious goodies. She is currently in her last year of college studying business and marketing. Maritza has been working at LRdE since 2013 - one of the very first employees ever hired. She is responsible for keeping all of the buildings clean and she does her job with pride and excellence. 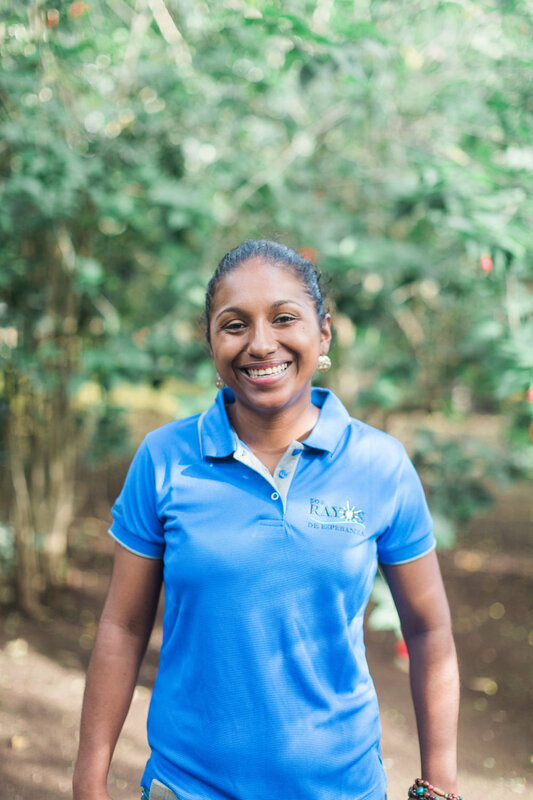 Maritza says that she enjoys cleaning and loves her job, however, her greater love is her family. She is married to Juan Gabriel and has two children: Nahum and Leyla. Maritza and her family live with her mother-in-law in the town of Diriomo. In her spare time, Maritza enjoys church, singing and playing with her children in the park. She is in charge of a small group in her church. She would like to continue studying Hotel and Tourism Management. At LRDe Carmen is an assistant to our house manager. She helps with cleaning and cooking. Carmen is married to Heraldo Gómez and has 4 beautiful children. She is a very hardworking woman that loves to serve God with the multiple talents He has given her. She is somewhat of an entrepreneur and puts her hand to several cottage businesses. She also enjoys working in the fields. Carmen is very involved in her church, leading two small groups, evangelizing and leading women’s ministries. Carmen is a true definition of a servant. Ana serves at LRdE on a part time basis when volunteer teams are on site. She primarily works in the kitchen but is always willing to lend a helping hand wherever needed. She is quiet, reserved and very pleasant to be around. Ana is married to Luis Fletes and together they are raising two beautiful children. When not tending her home or working at LRdE you can find Ana helping her mom in her bakery store or serving as a Sunday school teacher in her church. William, or Don William as he is commonly referred to, is the security manager and gardener of LRdE. He loves taking care of plants. He is also a good handyman and is quick to help with any problems we are having on the facilities and grounds. Don William lives in Diriomo with his wife Aura and his 4 children, Gerald, Kenia, Bryan and Melissa. His children mean everything to him. William reports that hs is most happy when his wife is happy. At home, he is always building things for the homestead so that his family feels comfortable. In addition to spending time with his family, William enjoys eating – especially fried chicken. Ariel is a very hardworking gardener at LRdE. His role also includes keeping watch over the property and the volunteers that come to serve. Ariel is a very focused and meticulous individual. He takes great pride in doing things well and this really shows in his work. Many of the beautiful gardens at LRdE exist because of this man. Ariel has a son named Lester Stephen. He is very proud of young Lester and loves spending time with him. It is important to Ariel that his son Lester knows he has a hard working dad. He is one of our gardeners and security guards at LRdE. José works hard and fast, accomplishing a lot of work in a short amount of time. He is pleasant, responsible and is great at coming up with new ideas to improve the grounds and gardens at LRdE. Jose lives with his wife and her two daughters in a barrio not to far from LRdE. He’s a very sociable individual and loves to talk. Abel is our nighttime security guard. All visitors at LRdE can sleep peacefully because of the work of this humble man. Abel is married and has two beautiful children. His oldest son is a precious little boy with special needs. Able is a hard-working, responsible man and is very loyal to his family. Abel is a pleasure to be around and is always smiling.